(L-R): MoC Head Coach in Lagos/Olympic medalist Deji Aliu; Emmanuel Ojeli; Mercy Umoibang; Blessing Oladoye'; Favour Ekpekpe and MoC Founder/CEO Bambo Akani at the induction ceremony in Lagos. 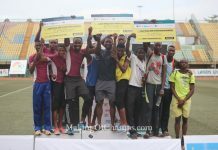 Leading Sports Media and Management Company, Making of Champions (MoC) on Tuesday, November 14th, inducted four new athletes into its Track Club in Lagos ahead of the 2018 Athletics season, which kicks off next week with the Athletics Federation of Nigeria (AFN) All-Comers in Abuja. 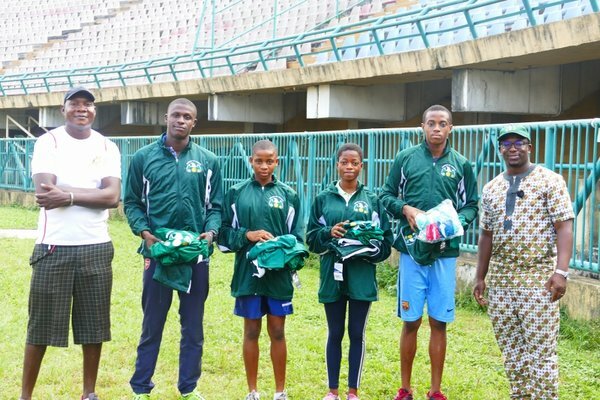 The four athletes comprising of two male and two female sprinters, are Emmanuel Ifeanyi Ojeli, Favour Ekpekpe, Blessing Oladoye and Mercy Umoibang. 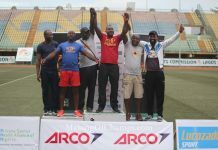 Emmanuel Ojeli is flanked by MoC Head Coach/Olympic medalist Deji Aliu, and MoC Founder/CEO Bambo Akani. 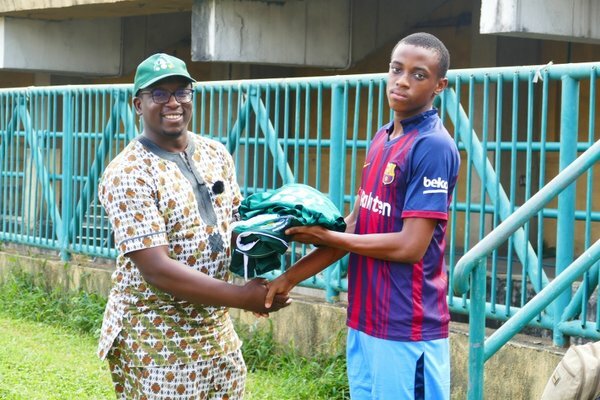 Ojeli first caught MoC’s attention at the 2016 Top Sprinter competition held at the Teslim Balogun Stadium in Lagos, where he won the Youth Boys 400m title with a then Personal Best (PB) of 51.78s. 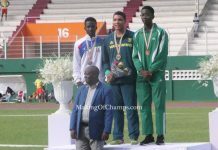 Ojeli then represented Delta State at the 2017 National Youth Games (NYG) in Ilorin where he lowered his PB to 48.89s, before going on to win the final in a new time of 48.23s. 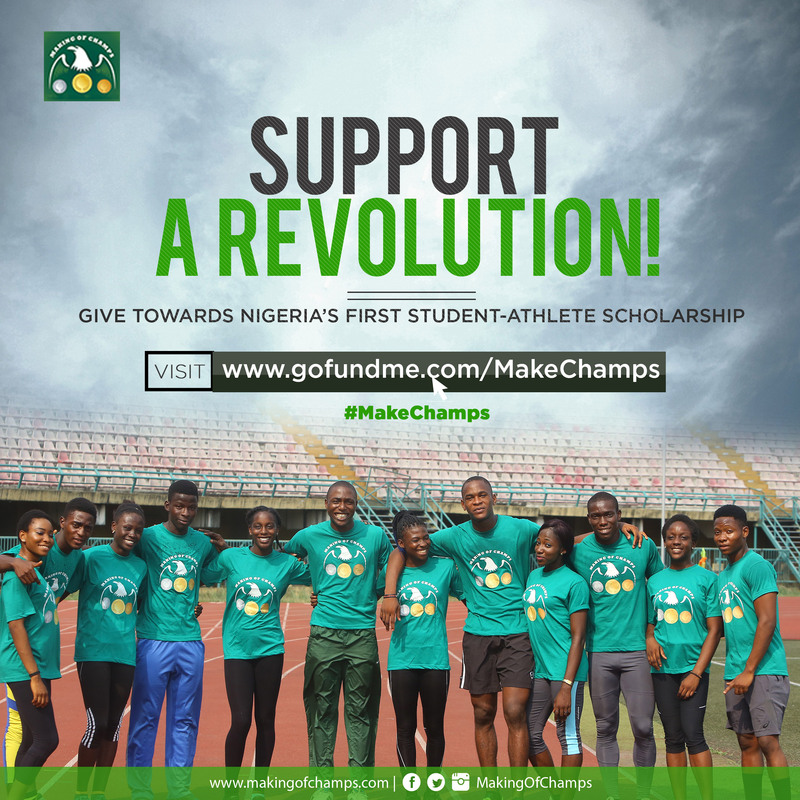 Initially based in Delta State, MoC relocated Ojeli to Lagos after the NYG and he currently trains with MoC’s Head Coach in Lagos, Olympic Medalist Deji Aliu, whilst studying to write his Matriculation examination into the university (JAMB) in 2018. 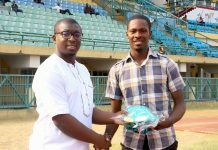 Favour Ekpekpe receives his kit from MoC Founder/CEO Bambo Akani. 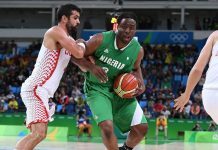 Ekpekpe on the other hand, was discovered by MoC at the Africare competition which was sponsored by Shell as part of its Youth Scholar Athletes Development Project (YSADP) earlier this year. The competition took place at Government College Ughelli in Delta State, Ekpekpe’s school, with the 16-year old also taking part in the event. Ekpekpe then competed in the heats of the Boys’ 100m and 200m at the 2017 AFN/MoC National U-18 and U-20 Championships. 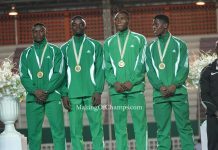 Having narrowly missed a slot on Delta State’s team to the NYG, Ekpekpe was snapped up by Kebbi State where he competed in the 100m and 200m. 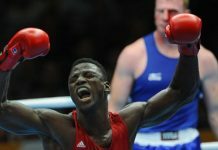 He won his 200m heats and then placed 5th in the semis, and then competed in the heats of the 100m. Okpekpe was relocated from Ughelli by MoC, and now trains with Aliu as well. Blessing Oladoye in a handshake with new coach Deji Aliu. 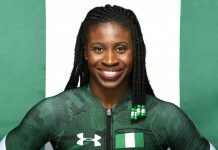 Oladoye, who is a younger sibling of former Team Nigeria athlete Funke Oladoye, decided to follow in the footsteps of her sister and competes in the 400m. 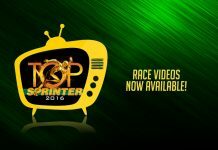 She first caught MoC’s eye at the 2016 Top Sprinter competition where she won her heat, and then claimed GOLD in the final. She represented Ondo State at the NYG, competing in the 200m and reaching the semis with her time of 26.82s. 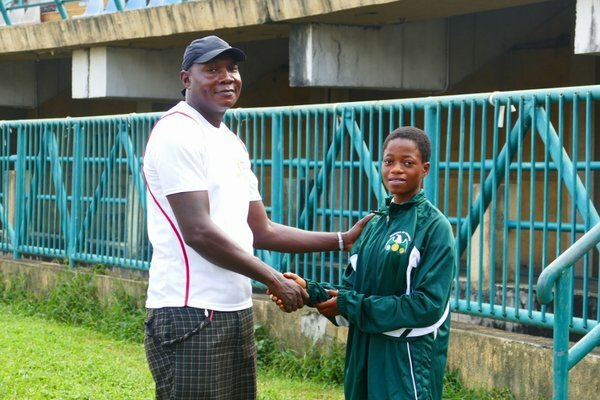 Having completed her secondary school education earlier this year, Oladoye moved to Lagos earlier this week and will be accommodated at MoC’s girls’-only Athlete House in Lagos while preparing for her JAMB exams, and will also be trained by Aliu. Mercy Umoibang who was discovered at the 2016 Skoolimpics, receives her kit from Bambo Akani. 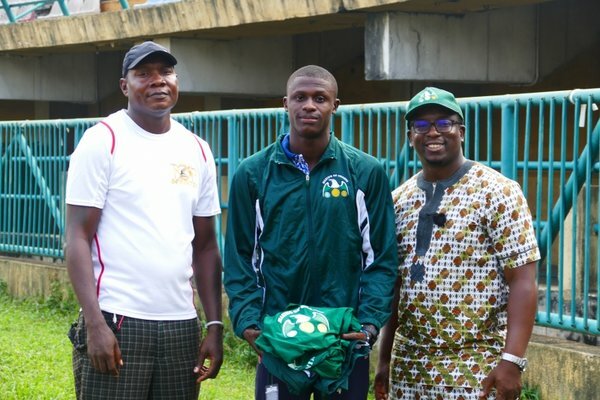 Last but certainly not the least of the new inductees into the MoC Track Club, Umoibang, was discovered at the 2016 Skoolimpics held at the Teslim Balogun Stadium. 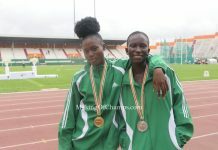 The 16-year old won her 100m heat at the event and has been training with Aliu ever since. 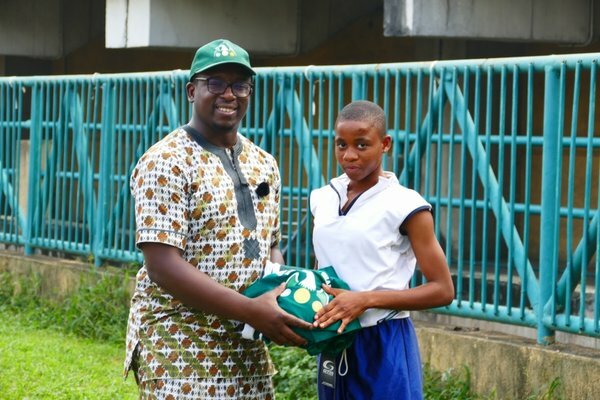 However, the SS1 student of the Army Children Senior High School in Lagos was formally inducted into the Track Club on Tuesday, and looks forward to achieving great things in her career. Speaking at the induction ceremony, MoC Founder/CEO Bambo Akani welcomed the athletes into club, and is confident that they will do Nigeria proud in the near future.